There are some spooky historical events hovering over the office of the United States President that go beyond natural explanation. Back in 1811 William Henry Harrison, then serving as a general in the army, got into a skirmish with a Shawnee tribe at Tippecanoe Creek, Ohio, that was attempting to break away from the reservation and return to their old ways. Those Shawnees were led by Chief Tecumseh, who later led a band of 2000 warriors against the Americans in the War of 1812. The union troops won both battles. Chief Tecumseh held such a grudge that when Harrison declared his candidacy for the presidency in 1840, the old chief cursed him. Tecumseh declared that if Harrison won the office "he will not finish his term. He will die in office. And when he dies you will remember my brother. You think that I have lost my powers. I who caused the sun to darken and Red Men to give up firewater. But I tell you Harrison will die. And after him, every Great Chief chosen every 20 years thereafter will die. And when each one dies, let everyone remember the death of our people." Harrison was the ninth elected president and just as Tecumseh predicted, he became the first president to die in office. His term lasted only one month. He became ill and on April 4, 1841, shortly after taking office, he died. The death list has continued right on cue ever since. --Abraham Lincoln was elected in 1860. He was murdered in 1865. --James Garfield, elected 1880, took office in 1881, assassinated Sept. 19, 1881. --William McKinley, elected to his second term in 1990, assassinated on Sept. 14, 1901. --Warren G. Harding, elected 1920, died of a heart attack on Aug. 2, 1923. --Franklin D. Roosevelt, elected 1940, died of ill health on Apr. 12, 1945. --John F. Kennedy, elected in 1960, assassinated Nov. 22, 1963. --Abraham Lincoln was elected to Congress in 1846. John F. Kennedy was elected to Congress in 1946. --Abraham Lincoln was elected President in 1860. John F. Kennedy was elected President in 1960. --Both wives lost a child while living in the White House. Both wives were with their husbands when they were shot. --Both Presidents were shot on a Friday. 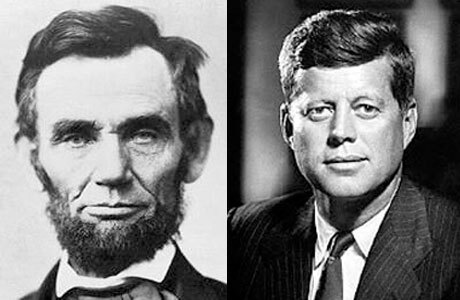 --Both Presidents were shot in the head. --Both men were succeeded by Southerners named Johnson. --Andrew Johnson, who succeeded Lincoln, was born in 1808. Lyndon Johnson, who succeeded Kennedy, was born in 1908. --Both alleged assassins were themselves assassinated before they were tried. --Both alleged assassins are remembered by their three names. --Lincoln was shot at the Ford Theater. Kennedy was shot in a Lincoln car made by the Ford Motor Company. --Lincoln was shot in a theater and his assassin fled to a warehouse. Kennedy was show from a warehouse and his assassin ran into a theater. --Ugly conspiracy theories have evolved around both assassinations. --A federal mint in Dallas issued a dollar bill just two weeks before Kennedy was shot there. It is now known as the Kennedy assassination bill. Since Dallas is the location of the 11th of 12 Federal Reserve Bank districts, the bill has the letter K, or the 11th letter of the alphabet, printed on its face. Also the number 11 appears in each corner. The serial number of this bill begins with K and ends with A, suggesting "Kennedy Assassination." Kennedy was shot on the eleventh month of the year. Adding the two elevens on either side of the bill makes 22, the date of the shooting. The series number is 1963, the year Kennedy died. --Both Lincoln and Kennedy were attempting to change the way the nation printed its money and get away from borrowing from the Bank of England. To finance his army during the Civil War Lincoln issued government printed “greenbacks” and he intended to continue using them after the war ended. Kennedy wrote Executive Order 11110 that threatened to shut down the Federal Reserve and authorize Congress to print interest-free money to inject into the nation’s economy.